On a slow April Fool’s Day in the sports world Pardon the Interruption topped the cable sports network landscape with an average of 769,000 viewers and a 0.3 adults 18-49 rating. On NBCSN the Philadelphia Flyers versus the Pittsburgh Penguins averaged 611,000 viewers and a 0.3 adults 18-49 rating. The late Colorado Avalanche vs San Jose Sharks match averaged 296,000 viewers and a 0.1 adults 18-49 rating. The McDonald’s All-American High School Basketball game averaged 611,000 viewers and a 0.3 adults 18-49 rating. 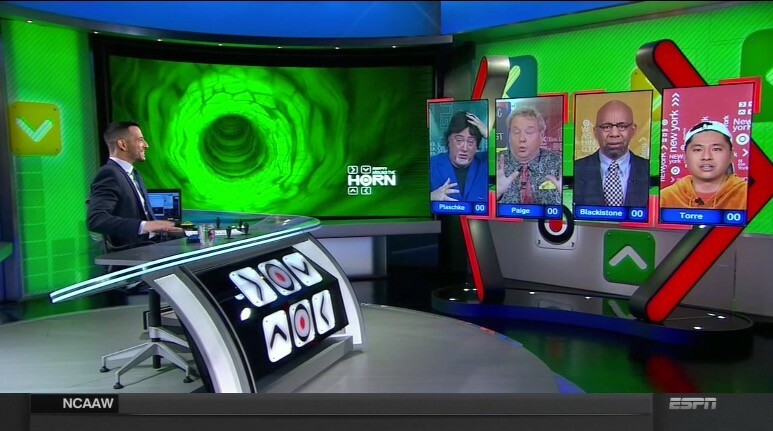 The April Fool’s time-warped edition of Around the Horn averaged 480,000 viewers and a 0.2 adults 18-49 rating. The Grantland Basketball Show averaged 457,000 viewers and a 0.2 adults 18-49 rating (its NBA Studio lead-in at 7:30p averaged 477,000 viewers and a 0.2 adults 18-49 rating.